Back in Part 1 of this series, we talked about what happens when you realize this is the end of homeschooling as you know it. There are many reasons why it might be the end for you, but if the ends because your last child is getting ready to graduate this year, then you had better start planning for it! I’ve written before about planning for a graduation open house, how to order a diploma, and how to make a transcript. 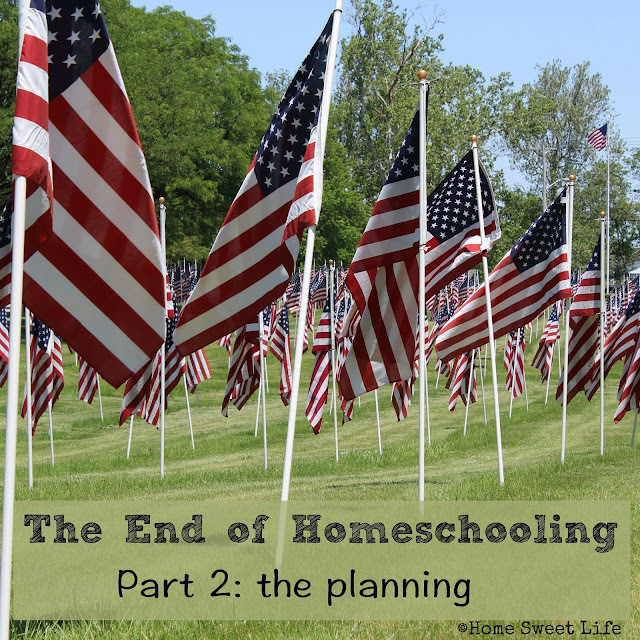 Those are the three biggest “to-do’s” when looking at a homeschool graduation, but something needs to come before that in your planning. You need to sit down with your spouse, and then your teen, and evaluate if they are really ready to graduate yet or not. God did not hand us little robots to watch over for 18 or so years, he gave us children - really unique little children - each with a special set of talents and weaknesses. Now is the time to evaluate. Do you think you have a year left until graduation? Great, then actually write down on a piece of paper what you hope for your student to accomplish in that year: courses to complete, life skills to learn, character traits to work on. As you’re looking at that list, is there something you can cross off because they’ve already learned it? Maybe they did so much volunteer work at the local theatre that you don’t really need a curriculum for their acting credit. Or maybe, they’ve had their own yard service business for four years and you can convert that experience into a business course credit. Seriously look again at your state’s graduation requirements. Have they met them, or will they by the end of the year? If not, give serious consideration to adding another semester, or even another year to their home education. It is much better to delay their graduation date than to send them out unprepared for their immediate future. Our oldest daughter spent 9 semesters in high school. Our younger daughter will as well. She will graduate sometime in December of this year, if, and only if, she completes what is still on her coursework list to graduate. This girl has never had a problem completing electives, but because of her dysgraphia, advanced math takes her a long time. We want her to be prepared, and to have sufficiently covered what she needs to before graduation. Now, look at life skills. Keep the same mindset, of if they could thrive, not just survive, on their own. Just because your high school senior may never write an actual check, this does in no way exclude them from learning how to balance a checkbook! Your young adult needs to understand what kind of tools they have at their disposal for managing their money, and they need to know there is a finite amount. Dad and Mom are not an ATM, and the real ATM will not give them any cash if they are overdrawn. Take time to make sure they understand how to budget, how to pay bills, how to read a bank statement, how to apply for and accept financial aid of they are going to college, and make sure they know that you love them! It is good to have the opportunity to succeed or fail with money while still at home, when they won’t have the electricity turned off if they make a mistake, and where you’ll still feed them if they run out of “their food” two days before payday. You also need to look at life skills like basic cooking, bathroom cleaning, vacuuming, and laundry. If your children have been helping you with these things for years, it is an easy check to make sure they can do them independently. If not, there is no time like today to get started! Do they get up with their own alarm, or do you have to go remind them? Do they actually brush their teeth every night? Simple things make a huge difference when Mom and Dad are not looking over their shoulders! For your last thought, what should you have known when you moved out on your own? Did you struggle with putting air in your car tires? Knowing when the chocolate chip cookies were baked but not burnt, or how to write a resume? Decide if any of those things need to get added to the list. Now, you’ve got a plan. Remember to adjust as needed. Your children will not and cannot know everything before they graduate, but they still have time to learn the necessities. They’re wonderfully bright, loving, almost adults. Give them extra room to grow, and extra grace to find their way.